Tom Joule started Joules in Market Harborough, Leicestershire in 2001. Joules is now one of the largest and most successful British clothing brands in the world. The boots might have white wax film may appear on the surface of the rubber boots and that it can be wiped off with a damp cloth. This "blooming" effect is not a defect. Blooming is caused when the boots are exposed to extreme temperatures or temperature swings and the wax helps prevent the rubber from weathering. If you're looking to buff up your boots and restore their shine and natural finish, this is what you'll need. A simple and effective way to keep your rain boots looking their best. 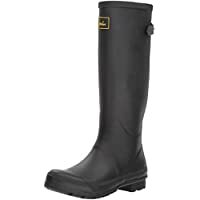 Heel measures approximately 1", Platform measures approximately 0.5"
A white wax film may appear on the surface of the rubber boot and can be wiped off with a damp cloth. This "blooming" effect is not a defect. Blooming is caused when the boots are exposed to extreme temperatures or temperature swings, and the wax helps prevent the rubber from weathering. The size printed on the bottom of the shoe is UK size and US size is printed inside the shoe. Removable cushioned insole for additional comfort. Rubber outsole for a pleasurable walking experience. Imported. Measurements: Weight: 1 lb Shaft: 8 in Product measurements were taken using size 13 Little Kid, width M. Please note that measurements may vary by size. Weight of footwear is based on a single item, not a pair. Add your personal touch to your rain gear with the Bow Back Welly Rain Boot from Joules® Kids. The Printed Welly Rain Boot from Joules® Kids will give your little one cool puddle jumping confidence! This "blooming" effect is not a defect. Blooming is caused when the boots are exposed to extreme temperatures or temperature swings and the wax helps prevent the rubber from weathering. Removable cushioned insole for additional comfort. Rubber outsole for a pleasurable walking experience. Imported. Measurements: Weight: 8 oz Circumference: 8 1⁄2 in Shaft: 4 1⁄2 in Product measurements were taken using size 8 Toddler, width M. Please note that measurements may vary by size. Weight of footwear is based on a single item, not a pair. it can be wiped off with damp cloth. This is the result of "blooming" (exposure to high temperatures). The wax helps prevent the rubber from weathering. Please note the size on the sole of the boot denotes UK sizing. 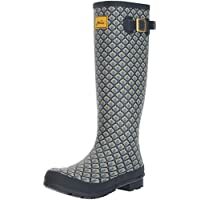 Fierce footwear is important all year long, get the Joules® Kids Downtown Tall Padded Winter Welly Boot for this fall and embrace new chic style. White wax film may appear on the surface of the rubber boots, it can be wiped off with damp cloth. This is the result of "blooming" (exposure to high temperatures). The wax helps prevent the rubber from weathering.